The Longest Lunar Eclipse of the Century Is Tonight. Here's How to Watch It. Everyone is talking about it! The longest blood moon lunar eclipse of the century! But you're not invited. On Friday, July 27, a full moon will pass through the Earth's shadow, resulting in a eclipse that will last for a whopping 103 minutes. That's 26 minutes longer than January's eclipse. With an eclipse that long, most of the people on Earth are going to see at least some part of this spectacular celestial event. Unfortunately, no one in the United States is going to see any part of it. If you're in Australia, Asia, Africa, Europe, and South America, all you have to do is look outside at the right moment. However, by the time the full moon rises in the US, the eclipse will have ended. Fortunately, the year is 2018, and you don't even have to put on pants to take part. The Weather Channel will be streaming the full eclipse on its mobile app starting at 4pm ET on July 27. The stream, which is only available to US viewers, will broadcast live from locations across the globe including Greece, Luxembourg, Italy, and Australia. A spokesperson says a module will go live on the app's home screen on Friday, making it exceedingly easy to find. ABC News is also making it easy to tune into the eclipse. The network will air live coverage of the event, "Lunar Eclipse: Once in a Century," starting at 3:30pm ET on its digital platforms -- abcnews.com, its various apps, and its various TV apps, including Apple TV. ABC's coverage will be led by ABC News correspondent Whit Johnson with Chief National Correspondent Matt Gutman along with reporter Julia Macfarlane and additional reporters stationed round the world. This stream sounds particularly appealing because it will include expert commentary and views of the eclipse from across the globe. You can also watch a live stream through the astronomy education site Slooh, which frequently streams astronomical events. That broadcast will start at 1pm ET on the player above. The moment of greatest eclipse will take place at 4:21pm ET, according to EarthSky. The full event will last from 3:30pm to 5:13pm. If you include the penumbral time -- when the moon is the lighter part of Earth's shadow -- the event will last for 3 hours and 55 minutes. After you stream the eclipse, you can head outside and catch some excellent stargazing in the U.S. The night of July 27 Mars will be in opposition and it's the peak of the Southern Delta Aquariid meteor shower. 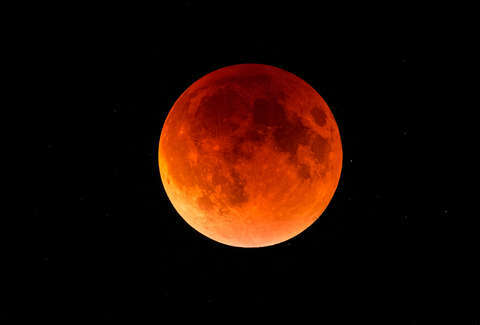 Lunar eclipses come infrequently enough that it's worth catch the beautiful event, as the moon turns a rusty shade of red. It's not exactly waiting for the final season of Game of Thrones, but you'll have to twiddle your thumbs until January 21, 2019, for the next lunar eclipse.